Posted on February 20th, 2019 in At large. At daybreak the wind was lightly SW. Unfortuately the Bureau tells us it’ll soon swing around to the SE as it picks up to be 15-20 kts later. The Sydney MHL buoy was seeing just under 2 metres at 9 seconds from the SSE – so there may be a few dribbly sideshore bumps around for the keen. Water may not be all that good given the rain of the last 24 hours. As I was tapping these words out, the radar was showing another band of showers headed toward the Northern Beaches – so not the most delightful conditions. HB pier southside one of the better spots in the State today. Surfline cam. Campus Point on a sparkling day when the Channel Islands look close enough for a paddle. A high will strengthen south of the Bight over the next few days establishing south to southeasterly winds through most coastal areas. Winds and seas in the north are likely to increase near the end of the week due to the presence of Tropical Cyclone Oma in the region, although there is currently a fair level of uncertainty regarding its movement and intensity. Cloudy. 70% chance of showers. Southeasterly 15 to 20 knots, reaching up to 25 knots offshore during the morning. 1.5 to 2 metres, decreasing below 1.5 metres around midday. Easterly around 1 metre, increasing to 1.5 metres around midday, then tending northeasterly 1.5 metres by early evening. Partly cloudy. 60% chance of showers. Northeasterly 1 to 1.5 metres. Posted on February 19th, 2019 in At large. Yay. The Sydney MHL buoy is back. But it’s only showing 1.5 m of 6-second east bump for you this morning. Count yourself lucky if you find anything I’d say. Not that there would be many surf options anyway given that wind was out of the ENE at 10 kts just before first light. And by mid morning it could be around to the south as a change develops. It’s set to stay southerly/SE’ly for the next three days. While Southern California has received welcome rains over the last few weeks, the usually reliable winter swells haven’t turned up to any great extent. And unlike in Oz, the long range swell models are painting a fairly bleak picture – particularly in the Santa Barbara area. Today is small to tiny from Santa Cruz to LA, and knee to waist way down south toward San Diego county (see Trestles). Holiday Monday and hardly anyone in the water at usually busy California Street, Ventura thanks to the knee high at best sets. A trough is extending a southerly change along the coast this morning and is expected to continue through central parts during the day before stalling and weakening on the Macquarie Coast, leaving a weakening northerly flow in the north. Behind this trough, a high is expected to strengthen south of the Bight during the second half of the week, pushing a ridge along the New South Wales coast and maintaining south to southeasterly winds in most areas. Winds and seas in the north may increase at the end of the week due to the presence of Tropical Cyclone Oma in the region, although there is currently a fair level of uncertainty regarding its movement and intensity. Northerly 15 to 25 knots shifting southerly 15 to 25 knots during the morning then tending southeasterly 15 to 20 knots in the evening. Northeasterly around 1 metre, increasing to 1 to 1.5 metres during the morning. Partly cloudy. The chance of a thunderstorm inshore during this afternoon and early evening. Southeasterly 10 to 15 knots, reaching up to 20 knots offshore early in the morning. Southerly 1.5 metres, decreasing to around 1 metre during the morning. East to northeasterly around 1 metre. Cloudy. 60% chance of showers. Around 1 metre, increasing to 1 to 1.5 metres offshore. Easterly around 1 metre, tending northeasterly 1 to 1.5 metres during the afternoon. Partly cloudy. 60% chance of showers. The chance of a thunderstorm in the morning. Posted on February 17th, 2019 in Surf Reports. A deep 1.7 m high tide at 0700 means everywhere was swamped for the early. There looks to still be some waist-ish weak little wind bump wafting in, so it’s not totally hopeless. Plus it’s going to be 29 C later, so finding a park at the beach will be a challenge. Wind wasn’t too significant as Sunday got started but those light northerly breezes will swing around to the NE and by this afternoon they’ll be into the 15-25 ktl range. The Sydney buoy is still offline, but looking at the Pt Kembla and Crowdy Head data, you’d have to guess Sydney was seeing around a metre of 8-9 sec mainly east bump. A high pressure system over the Tasman Sea is slowly moving east and extending a ridge to the northern New South Wales coast. This system will promote northeast to southeasterly for the remainder of this weekend. Later Monday a southerly change enters the far southern waters, and moves to central parts during Tuesday before stalling over the Hunter coast Tuesday evening then weakening during Wednesday. Northwest to northeasterly 10 to 15 knots becoming northeasterly 15 to 20 knots in the early afternoon. Winds reaching up to 25 knots offshore in the late evening. Below 1 metre, increasing to 1 to 1.5 metres during the afternoon. North to northeasterly 20 to 25 knots, reaching up to 30 knots offshore in the evening. Northerly 20 to 30 knots shifting southerly 15 to 25 knots during the day. Easterly around 1 metre, tending northeasterly 1 to 1.5 metres during the morning. Becoming cloudy. 50% chance of showers. The chance of a thunderstorm in the evening. Posted on February 16th, 2019 in At large. Looks like a nice morning for a little surf session – as long as you can find a bank. Swell seems pretty straight and in the 8-10 sec range for period. Wave faces should be in the waist to even shoulder high range on the biggest ones. Wind is light for the early. Tide’s dropping from the 1.7 m high at 0600 to the low at 1250. Should be a mostly sunny and warm day with the wind gradually picking up from the N-NE toward midday. Ocean’s on 21C. Forecast issued at 4:10 am EDT on Saturday 16 February 2019. A high pressure system centred over Tasmania is slowly moving east, and will drift across the southern Tasman Sea for the next few days while extending a ridge to the northern New South Wales coast. This system will promote generally northeast to southeasterly winds until late Monday, when a trough brings a southerly change up south coast. East to northeasterly about 10 knots increasing to 10 to 15 knots in the evening. North to northeasterly 15 to 20 knots, reaching up to 25 knots offshore in the late evening. Around 1 metre, increasing to 1 to 1.5 metres by early evening. Posted on February 15th, 2019 in At large. There are waves around this morning with some places getting into the chest high range or even a bit bigger. Surface conditions were smooth for the early risers, but as with yesterday, the swell is kinda lumpy and disorganised. The MHL Sydney buoy’s been offline for a few days now, so I can’t give you solid numbers this morning. If I had to guess, I’d say east-ish, 1-2 m and 9-10 sec apart. As of 0630 the wind was west 4-5 kts. It’s set to go around to the east later. Tide was high a little before 0500 and will back to low at 1145 as it warms to the 27C high this afternoon. Getting in early is/was the plan. As for the outlook, well, may I commend to you as always, the mighty Goat. California is seeing rain and onshore wind pretty much from north to south and surf prospects are minimal thanks to the sloppy, cold, windy and generally horrible conditions. There’s more rain on the way this weekend – which is a good thing, but yours truly won’t be braving the dodgy water anytime soon. A high pressure system over the southeastern Australia is slowly moving east, and will drift across the Tasman Sea for the next few days while extending a ridge to the northern New South Wales coast. This system will promote generally northeast to southeasterly winds until late Monday, when a trough brings a southerly change up south coast. Easterly about 10 knots increasing to 10 to 15 knots in the late afternoon. North to northeasterly about 10 knots increasing to 15 to 20 knots during the day. Below 1 metre, increasing to 1 to 2 metres during the afternoon or evening. Posted on February 14th, 2019 in Goat's Forecast. While you’ve been enjoying? warm weather in Sydney I’ve been enduring cold winds coming up from Antarctica. To make matters worse the winds didn’t even bring up any surf where I’ve been. Between the cold air, the cold water, and the .. surf… I haven’t seen any reason to take my board off the car, so far. Maybe tomorrow? But you don’t care about that do you? So in Sydney, I don’t think I’ve missed much surf from what I’ve been told. Thursday: down to around 1 metre or so East South East. Water temp in Sydney is around say 22ish. Where I’ve been… mostly greenish.. see below… which just isn’t right for Summertime surfing…not that I’ve seen any surf. Forecast updated at 8:16 pm EDT on Thursday 14 February 2019. Clear. Winds northeasterly 15 to 20 km/h. Partly cloudy. Light winds becoming easterly 15 to 20 km/h in the late afternoon then becoming light in the evening. Cloudy. Slight (20%) chance of a shower in the morning and early afternoon. Light winds becoming east to northeasterly 15 to 20 km/h in the late afternoon then becoming light in the evening. Sunny. Light winds becoming northeasterly 25 to 35 km/h during the day. Sunny. Winds northerly 15 to 20 km/h tending northeasterly 25 to 35 km/h during the day then becoming light during the evening. Partly cloudy. Slight (30%) chance of a shower. Light winds becoming south to southeasterly 20 to 30 km/h during the day. Partly cloudy. Medium (40%) chance of showers. Light winds becoming east to northeasterly 15 to 20 km/h during the day. Posted on February 14th, 2019 in At large. Looks like a mostly overcast start to the day in Sydney, but there are still a few waves to be had around the place thanks to the 2 metres or so of mainly south 9 second swell. Still some nort. . component in the mix, so conditions are floppy and bumpy with sets at best exposures getting into the shoulder high range. Tide is dropping to the low at 1030 and then will be back to high at 1620. As of 0700 wind was light from the W-SW. It should go around to the SE then move to NE later. 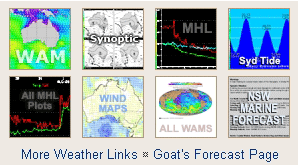 The Goat should drop a forecast later today, so as always I’ll be interested to see his call. A quick glance at the models says it could be small and marginal through to late Sunday early Monday, but then you might see a little uptick into the fun range. SW wind destroying an already weak and choppy NW bump at Campus point, Goleta this morning. The stormy conditions haven’t smashed Trestles yet. Only 6 people in the water and there are shoulder high sets!!! A high pressure system over the Bight will slowly move east and strengthen during the next couple of days, extending a ridge to the coast. By late Friday the high centre will have shifted into the southern Tasman Sea and direct northeast to southeasterly winds along the coast during the weekend. Southeasterly 10 to 15 knots turning east to northeasterly 10 to 15 knots in the evening. Southerly 1.5 to 2 metres, decreasing to 1 to 1.5 metres around midday. East to southeasterly about 10 knots tending east to northeasterly 10 to 15 knots during the afternoon. Posted on February 13th, 2019 in At large. Looks like head high lines at the right spots this morning. As of 0400 the MHL buoy was showing a combo of NNE and SSE. The longer period, lined up stuff was coming from the NNE and the more choppy mix of short and longer period components were coming from the south. At first light the surface looked reasonably smooth on the cams, but the wind is supposed to get more southerly as the morning goes along. Also, the north east swell is supposed to fade, so getting in early at a magnet is the plan. Tide’s low at 0800, so there should be a little extra push this am. Outlook is for the energy levels to subside across the next couple days and then the models get a bit contradictory for early next week. Fortunately we’ll have the Goat’s words of wisdom tomorrow evening, so maybe he can bring some clarity. Santa Barbara continues micro and Ventura’s dropped as well. The only decent wave I spotted on the local cams was down at Trestles where it was sideshore but shoulder high and pretty fun looking. Unfortunately for me it’s like being in Dee Why and knowing there are fun waves at Treachery – if I was prepared to spend the hours getting there. A southerly change has moved through southern and central parts of the coast, and is expected to slowly extend throughout the the remainder today, with fresh northerly winds forecast ahead of the change. A high pressure system over the Bight will slowly move east and strengthen during the next couple of days, extending a ridge to the coast in the wake of the southerly change. By late Friday the high centre will have shifted into the southern Tasman Sea and direct northeast to southeasterly winds along the coast during the weekend. Southerly 15 to 25 knots, reaching up to 30 knots early in the morning. Winds turning southeasterly in the late afternoon. Northeasterly 1 to 1.5 metres, decreasing to around 1 metre by early evening. Southeasterly 10 to 15 knots, reaching up to 20 knots offshore early in the morning. Winds turning northeasterly during the afternoon and evening. 1 to 2 metres, decreasing to 1 metre during the morning. Northeasterly 1.5 metres, tending easterly below 1 metre during the morning. Northeasterly 10 to 15 knots turning easterly during the morning. Longer period swell this morning? Posted on February 12th, 2019 in At large. Overnight it looks as though the 1.3 metre SE wind swell you had yesterday has gone from 5-6 sec to 11-12 seconds from the east. With any luck there’ll be some chest plus faces to be had at optimally aligned spots. Wind was pretty light early and coming from the SW, but as the day heats up to the predicted high of a scorching 37C, it’ll pick up and swing to the SE later. Ocean temp was 22C yesterday, so probably the same again today. Tide is low at 0800 and then back to high at 1400. Fresh northeasterly winds extend across the Waters ahead of a strong southerly change forecast to move through southern parts of the coast later today, and the remainder during Wednesday. A high pressure system over the Bight will slowly move east and strengthen during the second half of the week, and extend a ridge to the coast in the wake of the southerly change. Northerly 15 to 20 knots. East to northeasterly around 1 to 1.5 metres. Northerly 15 to 25 knots tending south to southwesterly before dawn then tending southeasterly 15 to 20 knots in the late afternoon. Winds reaching up to 30 knots early in the morning. 1 to 1.5 metres, increasing to 1 to 2 metres during the morning. Southeasterly 10 to 15 knots turning easterly below 10 knots during the afternoon. 1 to 1.5 metres, decreasing below 1 metre during the morning. Southerly around 1 metre, increasing to 1 to 1.5 metres during the morning. Northeasterly 1 to 1.5 metres, tending easterly around 1 metre during the morning. Posted on February 11th, 2019 in At large. A warm (27C) mostly sunny day coming up for Sydney this Monday and then hot tomorrow. 1.3 metres of 9-sec SSE wind swell out at sea early this morning and a light westerly as of 0530. The wind should swing to the north by daybreak or shortly thereafter and then as the day warms up, it will go around to the NE as it ramps into the 20-25 kt range. Tide’s low at 0710 and high again around 1315. Surf prospects don’t look exceptionally interesting, but you might find a little waist-ish bump at spots that like a lot of south. We’re seeing grey skies, the odd spot of rain and a small, weak west line here in Santa Barbara. There appears to be a touch more activity up at Santa Cruz, but it’s not exactly pumping. A weak high pressure system lies over the western Tasman Sea. Light coastal winds under the influence of the high will turn north to northeasterly and freshen in most areas today ahead of the next cold front. This front is forecast to push a southerly change through the region later Tuesday and Wednesday. North to northeasterly about 10 knots increasing to 20 to 25 knots in the afternoon. Winds reaching up to 30 knots in the evening. Below 1 metre, increasing to 1.5 to 2.5 metres around midday. Southerly 1 to 1.5 metres, decreasing to around 1 metre during the morning. North to northwesterly 15 to 25 knots, reaching up to 30 knots offshore early in the morning. 2 to 3 metres, decreasing to 1 to 1.5 metres during the morning. Northerly 20 to 30 knots tending south to southwesterly during the early morning then southeasterly 15 to 20 knots during the afternoon. 1.5 to 2.5 metres, decreasing to 1 to 1.5 metres during the morning. Northeasterly 1.5 to 2 metres, decreasing to 1 to 1.5 metres during the morning. 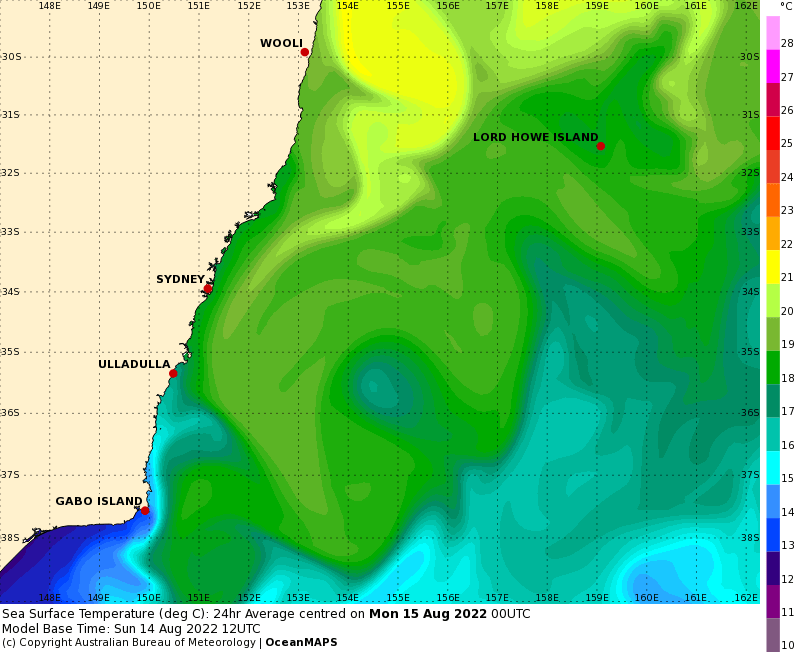 Southerly below 1 metre inshore, increasing to 1 to 1.5 metres offshore during the afternoon.